I had a fantastic day yesterday! A little history first though. I have always struggled with my weight. I have also always struggled with my fitness levels, never really believing that I could do anything sporty. I huffed and puffed and found excuses not to do sport at school. A few years ago a health scare or two had me buy my first pair of trainers in years. I started walking. At first I could only walk for a short while, but slowly I extended the length of my walks, and then the intensity. I think I only realised how fit I had become when I went beach walking (my favourite type of walk) with my teenage son. Off we went and the next thing I hear him behind me. ‘Who are you and what have you done with my Mother?’, he said. I will be honest here and say it is really hard to keep up with my walking and fitness. Because of the health challenges I face there are days, and sometimes weeks where I simply cannot exercise. I have however kept fit. Walking is so important especially for diabetics! Yesterday was one of those days. A beautiful spring day and my friend Ruth and I off to walk on the beach. When we arrived I started taking photographs – some of which will be on my other blog very soon – Kerry Buí Creates. We walked along the water line enjoying the chat and strolling along. 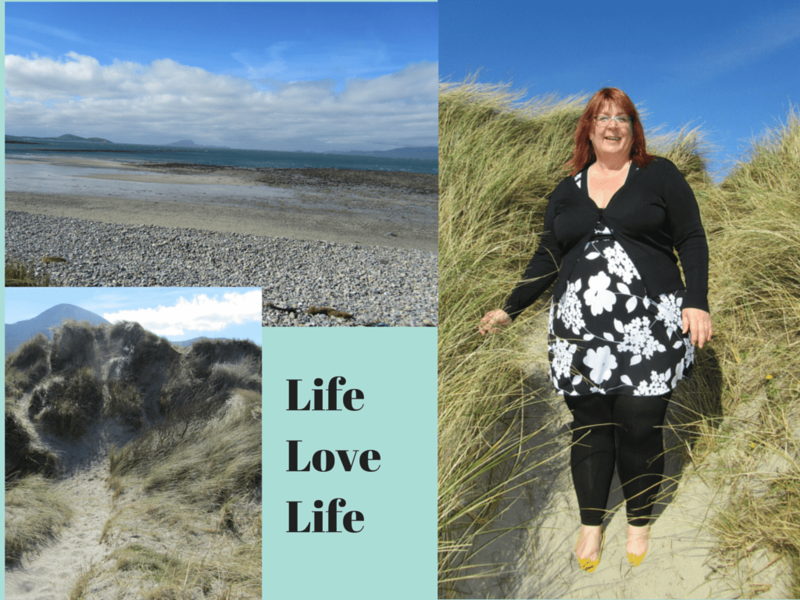 And then …..
Ruth suggested we walk on the dunes. The new Kerry says ‘I can’ and then thinks about it so off I went. When I struggled up the pebbled bank I worried a little but, when I got the dunes I really started to wonder if I could. You can Kerry. Up and down the dunes, sometimes wondering if I would have to resort to my hands and knees, we scrambled through the sand and grass. At the highest point I stopped and realised that I still had a long way to get back to the car. We did it though, and I was really proud of myself. I am a fabulous curvy woman but that doesn’t have to stop anyone from enjoying and embracing fitness. My hair has been something that I have always been proud of. It has been blond, pink, brown, fire engine red and is now a coppery colour lightening by the month to cover the emerging greys. Unfortunately life throws us curve balls. I live with a number of auto-immune diseases, and a few of these have hair loss and thinning as a side effect. I am being honest here when I say that hair loss is one of my biggest fears. A year ago I was prescribed Methotrexate for treatment of Rheumatoid Arthritis. And yes, you guessed it hair loss is a side effect. Methotrexate is one of the drugs used in chemotherapy and although people with RA take it in a much smaller dose the risk is still there. I have an underactive thyroid and Pernicious Anaemia too, both of which can effect the condition and thickness of hair. As this is a positive blog, and a positive post I am not going to dwell on the negatives, but will simply say that my hairdresser confessed that 2 months into the treatment, she didn’t tell me how bad my hair was (I did realise it on some level). She said she didn’t want to upset me. Right onto the positives. Despite having a smaller ponytail, my hair is back to looking shiny and bouncy – so how did I do it. I take Biotin – I treat myself to a tablet every day – and I know that this has made a huge difference, My hairdresser noticed after 6 weeks, and then she did comment and told me about the improvement. I also try to eat as healthy – lots of fruit and vegetables. I am also a great believer in the health properties of yogurt. I don’t wash my hair too often. Around once very 4 or 5 days. I have heard that this is a good idea as it protects the hair. I use a thickening shampoo. 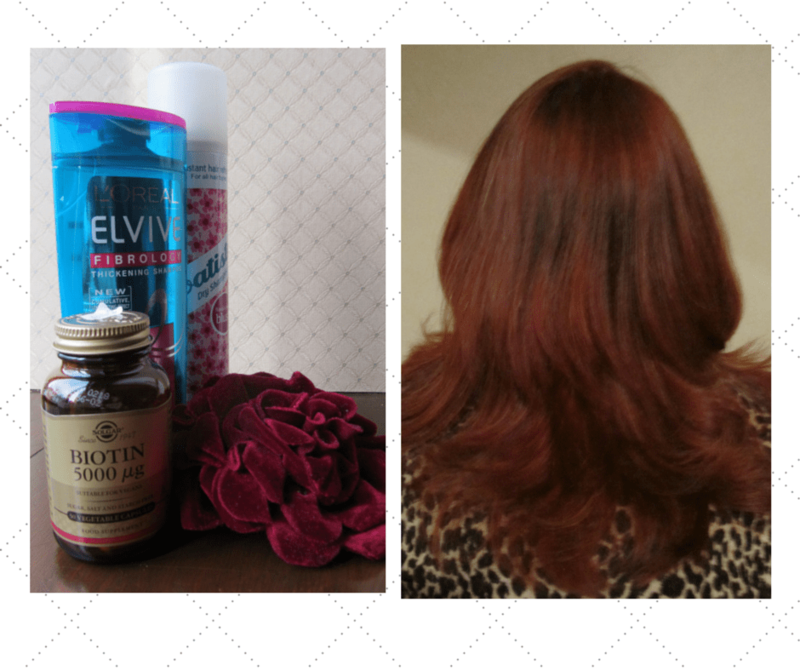 I have fallen in love with Elvive Fibrology Thickening shampoo. It has mixed reviews online, but I really think it makes a difference. I tend to swop my shampoo every couple of months, but I am on my third bottle of this now. I was away a few weeks ago, and used another shampoo. I could really see a difference – my hair was flatter and not as shiny. Linked to the fact that I wash my hair every 4 or 5 days, I love dry shampoo. It is my secret weapon. I have tried a few and keep returning to Batiste Dry Shampoo. I am convinced my hair sometimes looks better on day 3 because of this. A quick spray – massage the roots and a blast with the hair dryer and I am good to go out of the door in less than 2 minutes. I also trim my hair regularly and of course colour to hide those greys. For styling I dry my hair with a blast from the hair dryer and then use my trusty heated curlers. If I wear my hair up I protect it by using very soft rubber bands and hair pins. A woman’s hair is her crowning glory and we all deserve to feel pretty. I hope that these few tips will help those struggling with thinning hair. I strongly believe that the Biotin is key to this routine. Much of my other advice is cosmetic, but it is all about feeling fabulous.